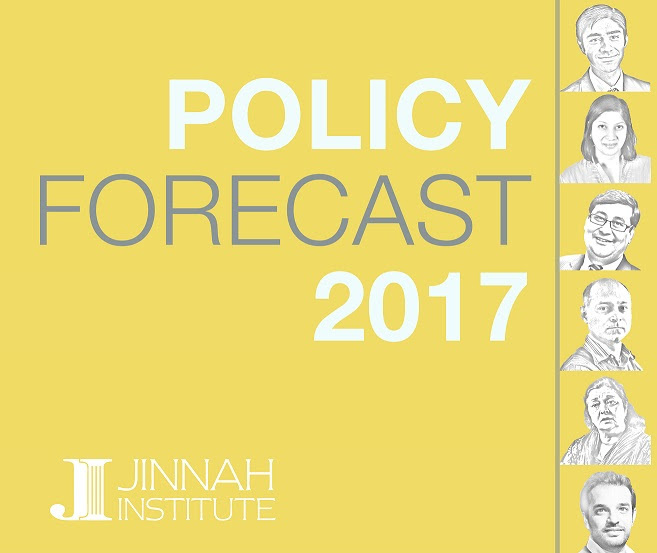 As Pakistan sets out to navigate 2017, Jinnah Institute asks thought leaders and policymakers to zero in on the most urgent policy interventions they would like to see the government undertake in key areas of National Security and Counter-terrorism, Democracy and Governance, Economy, Power and Energy, Climate Change, and Education. Two phases are critical in defeating major insurgencies and terrorist threats: bringing the insurgency from its peak to manageable levels of violence; and moving from this point to sustainable peace. Pakistan has completed the first of these, but through a military-heavy approach. It now faces the daunting challenge of achieving the second, where the military is irrelevant beyond its role in preventing the insurgency’s resurgence. The future lies in civilian CT and CVE efforts – in the National Action Plan’s success that is. The Pakistani state will have a hard time delivering adequately in this phase for two reasons. First, the civilian sector is simply not prepared to address this inherently complex problem in a coordinated manner. Doing so requires a clear chain of command, a strong civilian law enforcement operating without contradictory pressures that prevent it from doing its job, and a broader apparatus able to address the governance and service delivery issues that create fertile ground for violence. Civilian institutions remain weak, both because of lack of political will to strengthen them over the years, and the deep-rooted tensions between the relevant institutions, most prominent of which is the civil-military divide. Second, Pakistan’s domestic stability is intrinsically linked to regional peace. The more troubled Pakistan’s relations with its neighbours, the tougher Pakistan’s challenge to isolate their fallout from domestic security dynamics. Hardly ever have Pakistan’s ties with every neighbour except China been as damaged as they are today. This is unlikely to change in 2017. While a sudden resurgence in terror-related violence in unlikely, terrorists still retain the ability to strike from time to time. And fresh threats like Daesh loom on the horizon. 2017 then, promises to bring uneasy peace, but one that will be broken by periodic episodes of violence of varying intensity. Much work remains before we can confidently claim to be nearing sustainable peace. Pakistan’s election cycle is continuously lengthening, and policies in 2017 will be introduced with an eye to elections scheduled for 2018. This means we can expect expedient, ad-hoc and even contradictory policies as parties seek to woo key constituencies. The focus will remain on economic policies rather than the broader but critical issue-area of governance reforms, though we are likely to see further tinkering with election-related legislation in the name of electoral reform, and provincial-level education policies aimed at appeasing conservative groups. What we are unlikely to see is substantial reforms geared at improving the criminal justice system, particularly as anti-terrorism cases will continue to be outsourced to the military. The implementation of the National Action Plan, including its key requirement for madrassah reform, will also remain stagnant. Despite the media-circus around Panamagate, few new measures to tackle corruption and improve transparency are likely. And while the Centre and provinces will continue to muddle through in their bid to initiate China-Pakistan Economic Corridor (CPEC) related projects, civil service reform will be much discussed, but not implemented. 2016 was the warmest year globally in recorded history. Eleven of the last twelve months set new global high-temperature records. It was the 31st consecutive year that was warmer than average. In 2017, Pakistan will continue to be among the places that will see the collective impact of our global neglect. 2016 saw both floods and drought in Pakistan. Expect at least one, possibly more, climate calamities in 2017. The climate surprise for Pakistan in 2017 will not be that there will be climate catastrophes. The surprise will be that we will still be found surprised and unprepared in its face. We are clearly intensifying its impacts through man-made global climate change; in Pakistan, we are further aggravating these impacts by our callous disregard for actions that are needed at the local level. A disregard made worse by chronic bad local governance. Climate change is a global phenomenon. But the response to its impact in developing countries like Pakistan has to be local. Flash floods in Gilgit-Baltistan, heat waves in Karachi and droughts in Thar are not just natural disasters, and construing them as such would be a gross mistake. They are all made worse by our bad management of them. Weather cannot be avoided, but its impacts can be managed. They are best managed locally. The real costs of new power investments under the China-Pakistan Economic Corridor (CPEC) umbrella will begin to open up before us in 2017. While there is no expectation that these costs will be prohibitive, there is a decent likelihood that they will be a lot higher than what we have been led to believe. This will also be the year that sees the first real kick-start to rooftop solar, the real harbinger of change in power generation. Depending on how well the government operates net metering regulations, rooftop solar could either take off during this year or be stillborn. It remains to be seen how the government manages the costs of the new power investments it is undertaking. If it tries to disempower the regulator, and pass these costs onto the consumer, then a large part of the purpose behind undertaking these investments will be defeated. The power crisis is only partially the result of supply deficiencies. It is equally the result of high pricing in the power sector. If new supply is brought online at a very high price, and under terms that dissuades other (non-Chinese) investors from entering the market, then it could prove to be counterproductive. CPEC investments should not repeat the experience of the IPP investments in the second half of the 1990s. 2017 should also be declared the year of alternative power in Pakistan, and giving a big push to rooftop solar is critical. This can help mitigate demand for the distribution companies, as well as recoveries. Given the right policy mix in both these areas, 2017 could prove to be a pivotal year for the power sector. Let’s see whether that promise is lived up to or not. 2017 is a critical year that may just witness the activation of accelerators for education, as political parties in power brace for the upcoming elections with some implementation to showcase learning, education progress and increased levels of accountability across Pakistan. How many more innocent girls like Tayyaba, a recent victim of bonded child labor who was tortured and abused by her employers, will we need to sacrifice to a brutal exploitation at the hands of irresponsible citizens and parents? A constructive narrative and renewed goal-posted commitment is required from both state and society, as well as parents and guardians, in order to shore up the government’s efforts to fully implement Article 25 A Right to Education, given to this nation as a gift by virtue of its democratic dispensation in 2010. So far we have fallen short of achieving this target given a paucity of political, bureaucratic and societal will. In 2017, and en route to the 2018 general election, education must become a make-or-break game changer for political parties with frequent and better monthly data; be forewarned. Despite a recent upwards revision of Pakistan’s GDP growth prospects by multilateral-lending institutions, the economy is unlikely to cross the 5 percent growth ceiling during 2017. Sustainable management of a burgeoning public and external debt will be the foremost challenge faced by a government entering election season. Meanwhile, investments in construction, telecommunication and the auto industry are expected to go up in 2017. Of alarm is the Recent decrease in export growth and remittances and it is expected that the budget will include measures to provide relief to export industries. However, the rupee will likely remain overvalued during 2017, continuing to dampen Pakistan’s export prospects. The recent Chinese buyout of stakes in the Pakistan Stock Exchange will increase institutional investor confidence and result in Pakistan’s stock exchange remaining a leading emerging market destination. With global oil prices remaining low, inflation is likely to remain within the single digit. Investments under CPEC are expected to rise but timely completion of the western route and operationalisation of CPEC trade and energy projects will determine growth. A key concern will be government efforts at reclassification of Chinese loans under FDI. Currently, most CPEC projects rely heavily on Chinese labour and imported machinery. Whether the government will be able to push for greater collaboration with other global industry will determine long-term diversification in investments. Similarly the ratio of local labour to Chinese labour in CPEC projects will impact long-term employment prospects in Pakistan. The views in this publication do not necessarily reflect those of the Jinnah Institute, its Board of Directors, Board of Advisors or management. Unless noted otherwise, all material is property of the Institute. Copyright © Jinnah Institute 2017.